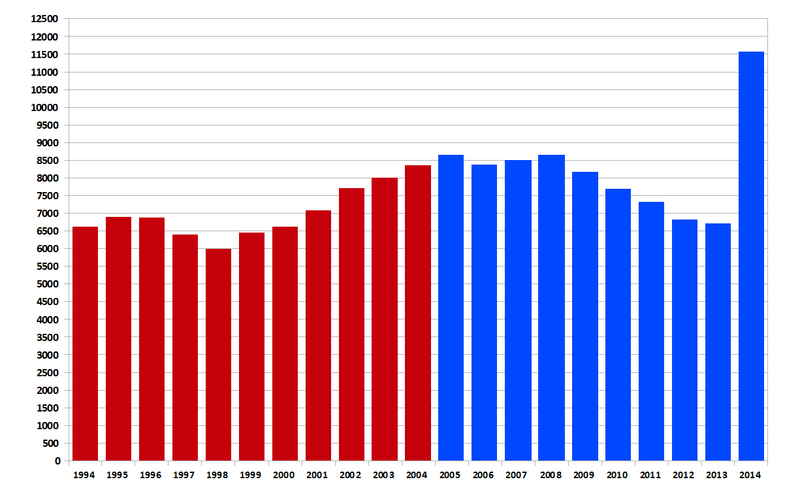 Per the Newfoundland and Labrador budgetary estimates, 1994-2014 passim, here's the total public-sector debt by fiscal year, cleverly colour-coded by party in office at the start of the fiscal exercise. Figures are in $million. Click to enlarge, if you dare. A page A1 story in The Telegram March 17, "Hands tied by Bill 29," suggested the government will not be able to make the findings of its Muskrat Falls project oversight committee public, since Bill 29 - the access to information law - prohibits the public release of reports prepared for cabinet. In fact, interim Premier Tom Marshall has since clarified that the access to information law allows the public release of reports prepared for cabinet, provided they have not been requested through the formal information request process first - a quirk of the access law. For further explanation, see the latest blog post from The Telegram's political reporter, James McLeod http://www.thetelegram.com/Blog-Article/b/25893/My-mistake. The "clarification" actually introduces errors of its own. Take this hypothetical: "James" applies for document XYZ under the Access to Information Act. The ATI co-ordinator denies James access under the Act, because of s. 18 of the Act, which was enacted as part of the paranoid, secretive PC government's Bill 29 in 2012. Does the fact that James has applied for document XYZ preclude government from releasing it, ex gratia, of their own meer motion, to Mary? Does the fact that James has applied for document XYZ preclude government from releasing it, ex gratia, of their own meer motion, to James himself? Good luck getting government to do so. But the fact that the document has been requested, does not inoculate it from being released, other than to that requester and pursuant to the request made under the Act. Never mind that's what the government has spent the past two years wanting you to believe. Never mind that they apply the supposed "principles" of the Act, including the Bill 29 provisions, to things other than the Access to Information requests that the Act governs. Subject to the Protection of Privacy portions of the Act, the government can release just about any record it chooses to. It just doesn't so choose. It only took nearly seven years — about the same length of time as he was ever in office — but the Progressive Conservatives, under whoever the Premier is this month, languishing about 20 points behind in the polls, and having burned through four Ministers of Justice, are finally making good on Danny Williams' 2007 promise to bring in provincial whistleblower protection legislation. A quick recap, then, of how we got to this point. Progressive Conservative Leader Danny Williams pledged Saturday a new Tory government will implement whistleblower laws in the first session of the legislature after the Oct. 9 election. "We'll get that on at the very earliest opportunity," Williams said in response to questions from reporters at a Carbonear shopping mall. "The very first session of the House that we have, that's something we'll have a look at. As a matter of fact, there'd be no reason why we wouldn't get it on." Mr. Speaker and Members of the House of Assembly: My Government moved early and effectively to shine the spotlight of accountability on the operations of the Government and of the House of Assembly. My Government commissioned Chief Justice Derek Green to recommend an overhaul of management procedures at the House of Assembly and subsequently enacted legislation reflecting his recommendations. Among his recommendations was a call for ‘whistleblower' legislation establishing procedures for the disclosure of wrongdoings and for protecting public servants who disclose wrongdoings. My Government will introduce whistleblower legislation this year after appropriate consultation has taken place. MR. KENNEDY: I can tell the hon. member opposite that we are, and have been working on the whistleblower legislation. We have looked at the legislation that is in place across this country, and we have had extensive discussions as to the nature and content of this legislation. However, what we are looking at now, there does need to be some consultation with certain groups to determine the matters of significance that would come under the whistleblower legislation. My understanding, and I can be corrected if I am wrong, but my understand was that we would bring in the whistleblower legislation during this session of the House, and I think that also includes the fall session. The Williams administration has yet to begin consultations it says are necessary to bring in a law protecting whistleblowers. "At this time government has not conducted consultations on this matter and as this legislation affects the public service for Newfoundland and Labrador, consultations will target the public service," Ken Morrissey, a spokesman for the Department of Justice, said in an e-mailed statement. MR. T. MARSHALL: In our party's blueprint in the last election we did indicate that in our second term we would develop whistleblower legislation, and we are in the process of doing that. Of course, we already have a form of whistleblower legislation. All members of this House joined in the passing of what I call the Green act which is the House of Assembly Accountability, Integrity and Administration Act which provides for protection for those public servants who might disclose information about wrongful activity on the part of a member of this House, an officer of the House, or an employee of the House. "Well, you know, the whistleblower legislation, we want to do right," said Premier Danny Williams, who said government is taking its time on Green's recommendation because he wants tight legislation. Williams said the existing access-to-information legislation has meant that government has been bogged down with what Williams called "frivolous requests." "It's a good thing. Access to information is a very, very important thing," Williams said. "But there are a lot of requests that come in that are very, very time consuming … The one thing we don't want to do here is just create another situation where we are going to put another stranglehold on government." 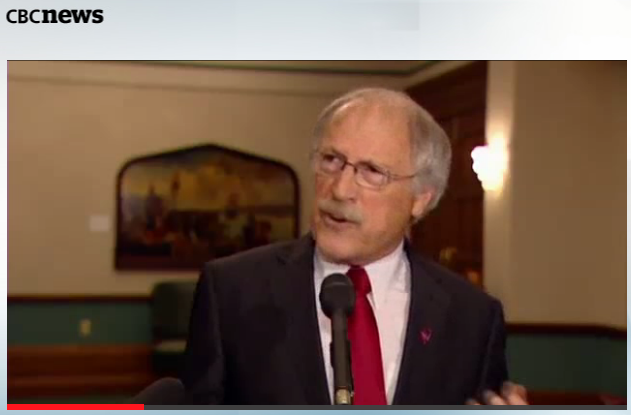 MR. F. COLLINS: Mr. Speaker, the department has consulted with jurisdictions all across Canada, all associations, anybody with a stakeholder interest in whistle-blower legislation. We have done a tremendous amount of work on it, a tremendous amount of consultation on it. We are monitoring existing legislation in other jurisdictions to see how it is working out. It is new in most provinces, and when we see how it works out, what discrepancies can be ironed out of these legislations, where the discrepancies are, and what the best practices are, Mr. Speaker, we will look at bringing in our legislation to serve the best needs of our public service. So, Mr. Speaker, for that reason, we will not support this motion. Not because we do not support whistleblower legislation. We have been considering and continue to consider whistleblower legislation, Mr. Speaker, for a number of years – and we continue to do so – but we will be voting against the motion, because the motion directs us to proceed immediately, when good government planning and prudence dictates otherwise. Mr. Speaker, there are a lot of questions one might ask when trying to strike a right balance with whistleblower legislation, and none of these questions, Mr. Speaker, are easily answered. I can tell you, Mr. Speaker, that there is no need to call upon government to consider immediately such an initiative, because, as I mentioned earlier, this government has been considering, and continues to consider whistleblower protections for public service employees. Mr. Speaker, to do so immediately, as I mentioned, would not be responsible. MR. F. COLLINS: Finally, Mr. Speaker, we get the question on whistle-blower legislation; we have been waiting all session for it. MR. F. COLLINS: Mr. Speaker, we value our public servants in this Province. They are the engines that drive government; they are the nuts and bolts of this government. We will give them every assurance they need, that their jobs are protected, that they have nothing to fear from reporting something untoward in the workplace. We do that in several pieces of legislation, and we do that in our assurance to them that they will not have to worry about any kind of repercussions because there is no specific whistle-blower legislation in place. They have lots of protection under all other pieces of legislation, and as I reiterate again, we will give them every assurance that they will not be retaliated or intimidated in any way by providing something that is untoward in the workplace. MR. F. COLLINS: Mr. Speaker, the whistle-blower legislation has been discussed at length in this House, or the lack of whistle-blower legislation. We made it clear, Mr. Speaker, in this House that when we see a piece of whistle-blower legislation that we can adopt, we will do that. In the meantime, Mr. Speaker, we have all kinds of coverage in our legislation and in the Criminal Code of Canada with respect to protection for people in the workplace. MR. KING: Mr. Speaker, I think the member opposite is probably referencing a topic that we have talked about many times in this House; it is the issue of whistle-blower legislation which, while connected perhaps to the previous topic, certainly falls within my department. As I have said before, we are quite confident at this point in time that our current legislation within the Province and current laws within the Province provide a lot of protection for workers to speak out. We encourage that, as a matter of fact, all the time. We want to hear from people. We amended a piece of legislation last week that provides just that particular protection so that people are feeling comfortable about speaking out. At this point in time, there is no intention to bring forward the whistle-blower legislation in this session of the House. An uptick in the PC's popular support, within the margin of error of CRA's methodology, and one point less of support than the Abacus poll taken in the immediate aftermath of former Premier Dunderdale's resignation, might be the silver lining that the Tories are looking for. But the trend — the real trend — is not all that rosey. Maybe the slight uptick in PC fortunes in the past half-year or so means something, and something that will last. Or maybe it's just the third dead-cat bounce that the party's fortunes have seen since Dear Leader first noticed that his support was starting to soften in 2010. 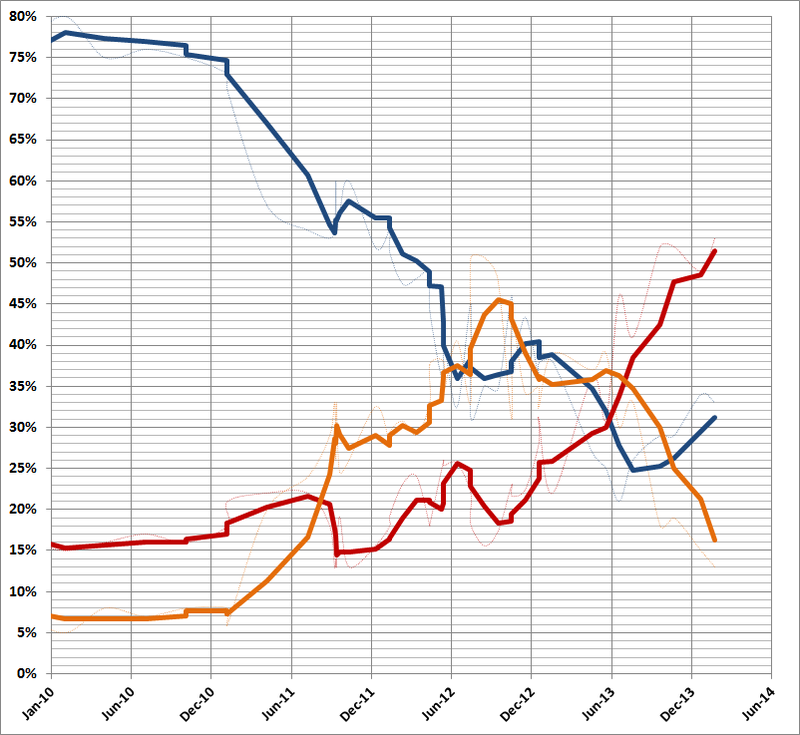 CRA is out today with the first poll conducted after the dust has settled on Kathy Dunderdale’s resignation. Here is what the notional-projection electoral map would look like in a general election where the CRA vote-intent figures reflected actual popular support. The Liberals would take 28 seats – up from 25 in the other most recent poll by Abacus – including St. John’s West. Another nine seats would be tossups in which the Liberal candidate would be one of the contenders. The incumbent PCs would retain at least eight seats, and would be contenders in eight of the previously-mentioned tossups. If all of the cookies crumbled their way, the PCs would have a remote chance of retaining up to 16 seats and official opposition status. The NDP would notionally hold on to three seats... but one of those is St. John’s North, where things have changed. Note the important caveat that the forecast models do not take into account changes in party affiliation of the incumbent (St. John's North, St. John's South, Mount Pearl, Straits and White Bay North), nor a seat which has changed hands through a by-election (Carbonear–Harbour Grace). These districts are marked with an asterisk. As with all poll projections, the overall seat-count result tends to be more accurate than the district-by-district count when the models are tested post-election. The errors in individual district forecasts tend to cancel one another out. Interestingly, the notional “tossup” seats, those in which the projection models are in disagreement, are heavily concentrated in and around St. John’s. These include the newly-vacated Virginia Waters, where a recent IVR poll showed a close contest between the Liberals and PCs as the by-election campaign looms. 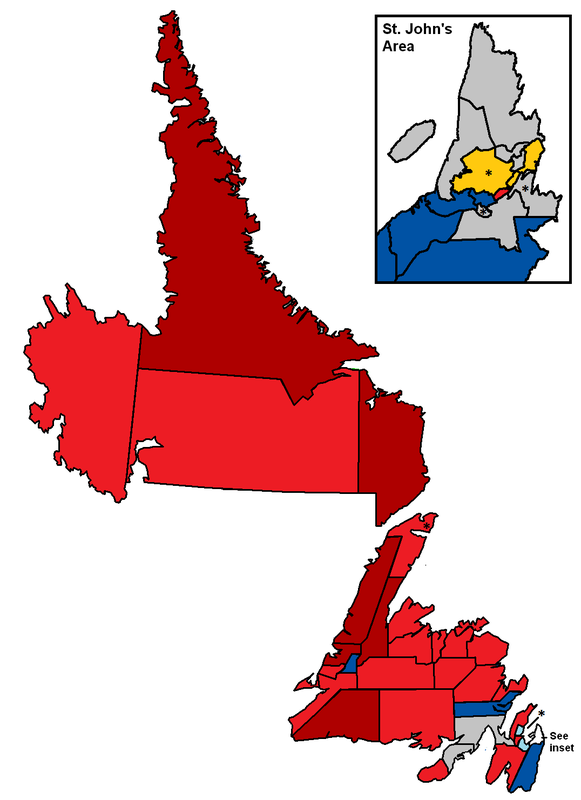 Poll projections in the latter half of 2013 also suggested a notionally close or “tossup” race in Carbonear–Harbour Grace, which in a real-world by-election test was carried by the Liberal candidate.